Shortly after we started racing the Europa with wide 6" mags, which were the maximum allowed in SCCA production car rules and using 21 x 8 x 13 racing slicks, we realized the rear hubs were just not made for this type of stress. It should be borne in mind that this was an early S-1 from Europa bearing the serial number 460097. I mention this because I understand that, someplace along the line, better material was substituted for some of the parts. At any rate, after much investigation, we discovered that the stub axle set-up, as used in the Chevrolet Corvair, could, with some reworking, be married to the aluminum rear hub carrier of the Europa. This consisted of machining out the seats for tapered roller bearings, cutting down the large flange of the Corvair stub axle, redrilling for stock Europa stud spacing and providing aluminum spacers to set the brake drum out approximately 3/8". Another item required was to redrill the brake shoes to allow the tension spring to move up out of the way of the larger wheel studs. 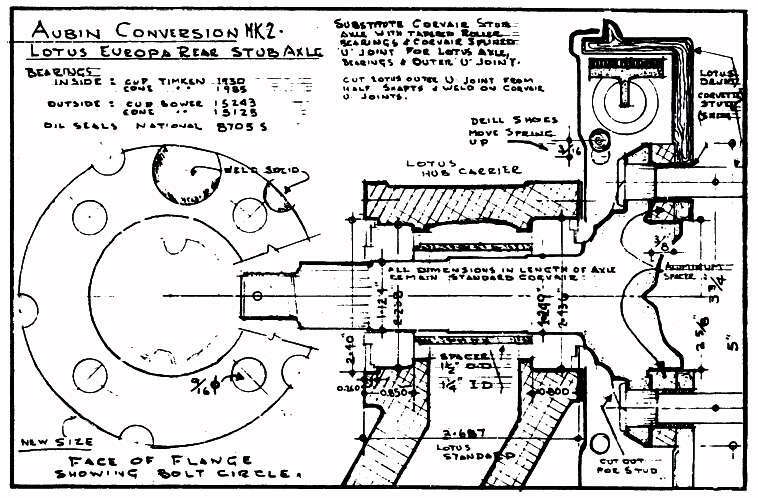 The enclosed drawing indicates the entire conversion of the hub. In addition, the half axles required a Corvair U-joint to replace the outer U-joint on the stock axle. The dimensions shown on the drawing are very close to actual but we have never yet set this up on a production basis so each set we have made have marginal differences of a few thousandths and a little bit of cutting and fitting will be necessary. These axles once installed and properly fitted give absolutely no trouble as the entire setup was designed in size for a car of much greater weight. We have never actually weighed the stock stub axle and wheel flange but the weight difference would be minimal. We have used these on three separate cars, all of which, at various times, have been raced, hill climbed, and slalomed and we can unhesitatingly recommend them to anyone who wants trouble-free rear axles. If anybody in Los Angeles area would be interested, we recommend that you contact Jeff Donahue, Donahue Engineering, 4100 Glencoe Avenue, Venice California, Tel: (213) 821-3330. Jeff keeps a set of these axles on the shelf for sale and would be happy to install them in your own hub carrier and make the changes on your half axles. We also recommend that adjustable lower links be installed at the same time as, with the addition of these axles, the temptation to put on big fat tires becomes irresistible and the adjustment of the rear camber becomes mandatory.